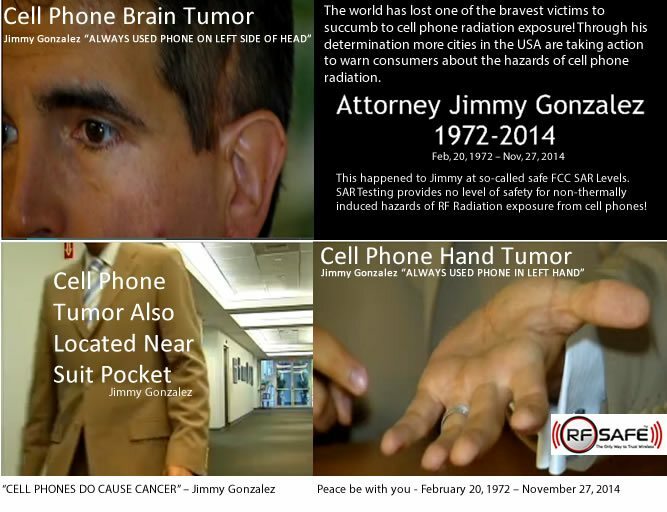 Sadly, Florida Attorney Jimmy Gonzalez has succumbed to several DIFFERENT cancers ALL caused by cell phone radiation exposure! Since Jimmy’s warning about cell phones causing GBM (Glioblastoma) brain tumors, there is a rapidly growing list of political brain tumor deaths potentially linked to wireless radiation exposure that now includes the very honored Senator John McCain who has succumbed to his GBM (Glioblastoma) diagnosis. Jimmy vs. Cell Phone Induced Cancer – A battle Jimmy fought to the end, and it is a battle RF Safe will continue in his dedication along with all the other lives which have been destroyed by a tradition of wireless profits before people. Our prayers go out to Jimmy Gonzalez’s wife, children, and family! I’ve felt their pain and frustration over the issue of RF Radiation exposure. I attribute the death of my daughter Angel Leigh Coates to RF Radiation exposure as well. Just as Jimmy did, RF Safe will continue this battle through to our last breaths too! God Bless You, Jimmy! Gonzalez, an attorney who used to use his cell phone for several hours a day, is now cancer-free. Some studies from the World Health Organization, Government Accountability Office and National Cancer Institute say cellphones could be linked to cancer, but scientists say more research is necessary. “Cities do that, they make people aware of other cities or people that have something wrong with them or something else like that, and I think that’s our job to make people aware of these things,” Ortiz said.